Editors’ Note: There is a map associated with this press release. MDN Inc. (“MDN”) (TSX:MDN) notifies its shareholders that African Barrick Gold plc (ABG), the project operator of the Tulawaka gold mine in Tanzania in which MDN has a 30% participating interest, announced fourth quarter and annual operational results. During 2011, ABG twice extended the mine life at Tulawaka, currently to the end of 2012. The project continues to outperform the original underground feasibility study and generate healthy cashflows. ABG will continue to explore in the East Zone and has recently begun the process of opening the West Pit Extension in order to provide supplemental mill feed and is confident they can further extend the mine life. In 2012 at the mine level, the expectation is for broadly similar production levels to 2011 at Tulawaka mine. Tulawaka has continued its good performance with production increasing 40% year-on-year mainly driven by the increased underground grade delivered. As the stockpiles from the exhausted open pit ran down, they began the process of opening the West Pit Extension in the fourth quarter to provide supplemental mill feed to the high grade underground ore in order to optimize the mill. Tulawaka continues to outperform expectations, both in regards to production and cash costs, consequently they have been able to extend the mine life twice in 2011, through to the end of 2012. Due to the further life of mine extension, the management team has been able to re-focus on production and as a result delivered a 40% uplift in ounces on 2010 at a comparable cash cost. They continue to invest in exploration drilling and hope to be in a position later in the year to make a commitment on further mine life extensions. The mine’s total gold production for the year was 84,101 ounces compared to the 60,134 ounces achieved in 2010. The increased gold production level resulted from a greater proportion of the mill feed coming from the underground higher grade ore and fewer lower grade materials from the stockpiles than in 2010. In the fourth quarter the West Pit extension was progressed in order to provide incremental mill feed replacing the existing low grade stockpiles and supplementing the underground operation. Gold ounces sold were in-line with production and up 31% on 2010 reflecting the increased production. Cash costs for the year were US$727 per ounce sold compared to US$709 in the prior year. This cost increase was mainly due to greater mining activity which resulted in increased headcount, maintenance and contracted services as well as higher costs of sales driven by higher revenue. The cost increase was almost totally offset by the increased ounces produced and the increased capitalised costs associated with deferred stripping and underground development. Cash costs per tonne milled increased to US$146 in 2011 from US$93 in 2010, primarily as a result of the higher cost of underground mining and a lower mill throughput due to the higher grind index associated with higher head grade. Capital expenditure for the year totalled US$31.7 million compared to US$15.5 million for the previous year. Expenditure was focused on increased investment to extend the mine life and includes capitalised underground development (US$6.5 million) security infrastructure (US$3.7 million), drilling costs (US$2.8 million), capitalised open pit stripping costs (US$2.5 million) and additional mining equipment. Included in capital expenditure is a non-cash reclamation adjustment which amounted to US$11 million. Exploration drilling at Tulawaka continued to demonstrate the potential to extend the mine life beyond 2012. They were able to successfully extend the mine life twice at Tulawaka in 2011, through to the end of 2012; and the ongoing drilling programmes are focused on extending this further. Much of 2011’s focus was on the East Zone Underground extensions where they continued to extend the known high-grade mineralised shoots below 7-Level, down to 12-Level, indicating potential to extend the mine life further. 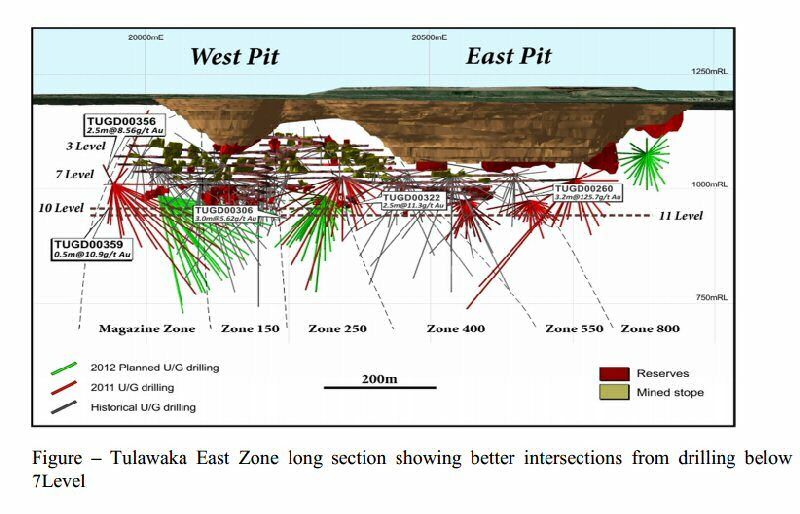 Drilling to date indicates that existing mineralised zones continue to at least 180 meters below the floor of Tulawaka’s now-completed open pit. A second portal into the Tulawaka East Zone Underground is anticipated to commence in Q1 2012 to further assist with access sites for additional resource expansion drilling and increase production from gold ore in this part of the underground. ABG expects to continue the drill programmes throughout 2012, which will focus on extensions of mineralisation below the eastern end of the final open pit. In this way, they will be able to assess the possible significant expansion of their current resource base to add further reserves and extend the mine life through an exclusive underground operation. In 2011, the mine operator also tested the Mojamoja and West Zone prospects which lie approximately 4km northwest of the Tulawaka plant, and ABG is looking at the potential to delineate further open pit resources to be trucked to the plant. The current infill programme is aimed at delineating additional resources between the two previously drilled areas and was completed in January 2012. Mineral reserves and mineral resources estimates contained in this report have been calculated as at 31 December 2011 in accordance with National Instrument 43-101 as required by Canadian securities regulatory authorities, unless otherwise stated. Canadian Institute of Mining, Metallurgy and Petroleum (CIM) definitions were followed for mineral reserves and resources. Calculations have been reviewed, verified (including estimation methodology, sampling, analytical and test data) and compiled by ABG personnel under the supervision of ABG Qualified Persons: Nic Schoeman, Director of Technical Services, Richard Adofo, Corporate Manager, Geology and Tisa Chama, Corporate Manager, Mine Planning . However, the figures stated are estimates and no assurances can be given that the indicated quantities of metal will be produced. In addition, totals stated may not add up due to rounding.